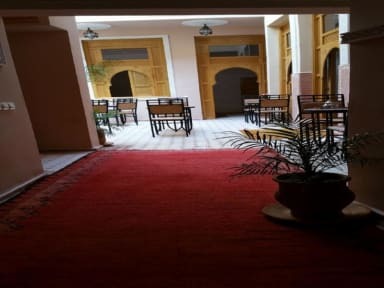 Riad Jenan Adam i Marrakech, Marokko: Reservér nu! Riad Jenan Adam has 6 comfortable rooms. The decoration is a subtle mixture of Moroccan craftsmanship with contemporary touches. Enjoy our hospitality while enjoying the traditional tea and mint welcome, gradually soak up the beauty and charm. You are now with you during your stay. push the door of Riad Jenan Adam. Install yourself in his light patio to soak up calm and gentleness after the bustle of the souks. Let yourself go, let you discover the delights of Moroccan cuisine, and make every effort to keep you a delicious memory of Riad Jenan Adam. 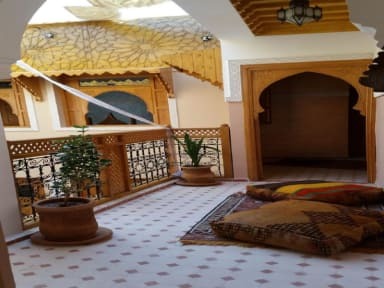 Riad Jenan Adam is located to 5 minutes from the famous Jemaa el Fna, district of Sidi Abdelaziz, 15 minutes from Marrakech Menara Airport and 15 minutes from the train station. We have 6 comfortable rooms, all air conditioned with bathroom and toilet, free wifi access. Our team is there to advise you. Where to go, what to see, what to do. We will help you build the room than you imagined. No stress, just fun and happiness to be lulled into the sweet atmosphere of the riad Jenan Adam. Taxes not included - occupancy tax 2.50 EUR per person per night and tax of touristic promotion 1.50 EUR per person per night. Cancellation policy: 7days before arrival.